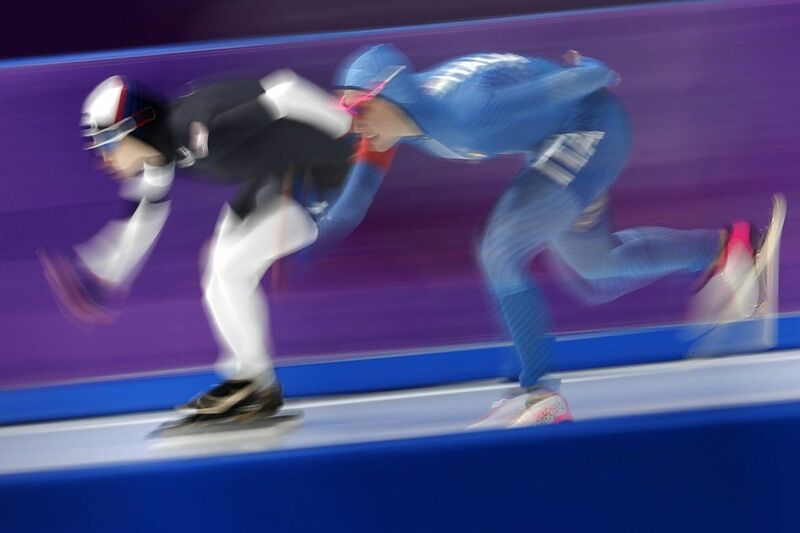 Mia Manganello of the United States, left, and Francesca Lollobrigida of Italy, right, compete during the women’s 1,500 meters speedskating race at the Gangneung Oval at the 2018 Winter Olympics in Gangneung, South Korea, Monday, Feb. 12, 2018. Highlights of Sunday's action at the 2018 Winter Olympics in Pyeongchang, South Korea include ice dancing, women's speed skating and men's two-man bobsled in prime time on NBC. Click here for a viewer's guide to find all the channels televising Olympics action on your cable or satellite system. Click here for the TV schedule for the entire Olympics. If you want to watch online, all events are streamed live via NBCOlympics.com and the NBC Sports app. Access is free with authentication through participating pay-TV providers. Remember that Pyeongchang is 14 hours ahead of Philadelphia, so over the course of the Olympics many live events will take place at late hours of the night. For example, 8 p.m. Eastern — when NBC's flagship broadcast goes on air — is 10 a.m. in Pyeongchang. Here are Sunday's full television listings. All listed times are Eastern. 12:35 a.m. to 2 a.m.
2 a.m. to 4:30 a.m.
2:40 a.m. to 5 a.m.
5 a.m. to 7:10 a.m.
7:10 a.m. to 10:15 a.m.
10:15 a.m. to 1 p.m.
7 p.m. to 10:15 p.m.
5 a.m. to 7 a.m.